The Indian Ocean is able to act as a major carbon sink due to its capacity to absorb three times as much atmospheric nitrogen – a key fertiliser for marine plant growth – as the Atlantic. This finding came from the $23million around-the-world ‘Malaspina' science expedition, involving Spain and nine other countries, including Australia. Urban communities are refining the age-old technique of composting domestic organic waste to help address the declining fertility of agricultural soils. Global warming is not just threatening biodiversity – it is challenging the way scientists think about conservation. How can a species be preserved in situ if its habitat may disappear under climate change? Managed relocation may preserve some species for the future, but its success will rely on good science and a sound risk assessment. Spain's latest large-scale commercial concentrating solar thermal plants have advanced the generation of solar energy around the clock by using thermal storage. Meanwhile, research continues on the role that concentrating solar thermal plants can play as baseload power support technology under different scenarios. Biologists should not over-commit time and effort in establishing broader climate change links to local ecological impacts, say an international team of United States, Spanish and Australian researchers. Instead, biologists should aim to achieve a balance between identifying and understanding climate change impacts, and planning for the consequences. Climate change is increasing the vulnerability of life on Earth to persistent organic pollutants (POPs), a UN research team concluded in a major study previewed at the international climate change talks in Cancun in December2010. The Greenland and Antarctic ice sheets are losing mass at an accelerating pace, according to a recent NASA-funded satellite study based on nearly two decades of monthly satellite measurements. As a child, Everald Garner fell in love with Tasmania's wilderness. But since the 1970s, when she first became aware of development impacts, she has been – by her own admission – something of an environmental ‘stirrer'. Now living in Nowra, NSW, the 79-year-old retiree is hosting a series of meetings with friends, family and neighbours as part of the CSIRO's and Department of Climate Change and Energy's Energymarkprogram. 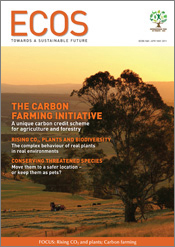 The federal government's proposed Carbon Farming Initiative (CFI) is designed to unlock the potential benefits from reducing greenhouse gas emissions and sequestering additional carbon in Australia's agricultural and forestry sectors. It is also an international first. An estimated 60 per cent of Australian households own a pet, with dogs and cats the companions of choice. A recent study suggests replacing some introduced pets with native mammals could help preserve dwindling populations in the wild. A new Seasonal Streamflow Forecasting service, developed by the CSIRO and the Bureau of Meteorology, is helping reduce the uncertainty faced by Australia's water managers in managing their resource. People's values and beliefs about climate change, and how these influence their actions, is a complex relationship – and one that is increasingly important as all tiers of government grapple with designing climate change policies and actions. What do sheep dogs have in common with Victoria's erratic weather? A lot, as farm extension staff at the state's Department of Primary Industries (DPI) discovered when faced with the challenge of communicating climate change science to farmers, many of whom are sceptical about climate change. Will increased carbon dioxide emissions usher in a new era of more abundant vegetation, enhancing plant production as well as food and shelter for wildlife? While it's true that CO2 pumped into an artificial greenhouse is a potent fertiliser, planet Earth's biosphere is not so simple. Carol Booth and Tim Low look at some scientific evidence that highlights the issue's complexity. Understanding that neural pathways reflect our experiences, and shape our perception of ‘facts', provides valuable insight into how more effective ‘stakeholder engagement' can be run. Can Australia grow an economically and environmentally-sustainable biofuels industry on waste biomass? Joely Taylor investigates. How does today's climate change differ from similar events in the past? What does the best science tell us about where we are heading? And how does research suggest we should respond to the challenges? CSIRO summarises the latest peer-reviewed research in a new online book – Climate Change: Science and Solutions for Australia.